One of the most amazing of all of the gingers is the Torch Ginger, a huge variety of flowers as well as great foliage. The flowers have long stems and will last as a cut flower for over a week in good conditions. So they make wonderful garden plants, and great cut flowers, however the Torch Ginger is also grown for other uses. The flowers that are in bud form, ( Bunga Kantam) are edible and are used in stir fries, salads as well as Laxas. So what we see as an exotic flower is a widely used ingredient in South East Asian cooking. These are a very shallow rooted plant with the rhizomes sitting close to the top of the soil. Flowers grow on a separate stem that shoots from the base. Over time the rhizomes will spread and form a natural clump. Torch Gingers (Etlingera Elatior) are found in Malaysia, Thailand and other areas. Flower colour varies from brilliant red to pink and apricot, rare white flowering plants are also available. Other Torch Ginger varieties include, Etlingera corneri or ‘Siam Rose’, which is difficult to obtain in Australia at present and Etlingera hemisphaerica which has deep red tulip like flowers, again difficult to find. Care and growing conditions for Torch Gingers. All Torch Ginger varieties are a tropical plant and require these conditions to thrive. Generally torch gingers are best suited to tropical gardens, as they will grow to 4m they best grown in the ground and are not really suited to any but the largest of pots. 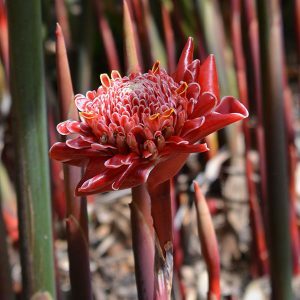 Etlingera Elatior can reach well over 3m to 5m depending on good conditions, large types can get to 7m, so its a good thing that the wonderful flowers appear on separate stalks that emerge from the underground tuber these stems will reach over 1m with the wonderful flower on top. These really are a tropical plant and require warmth and humidity to flourish, they not frost tolerant. In cooler areas, try a greenhouse. Flower colour – Red to pink. Foliage Green tinged with red. Propagation of Torch Gingers is from seed or by dividing the tubers. You can also propagate Torch Ginger from seed. Seeds are fairly easy to germinate in warm moist conditions, many growers use the plastic ‘baggy’ method. Germination will occur in around 1 month so be patient, wait until they get 5-6 cm before potting up. From seed to a fully grown flowering plant can take 3 – 4 years.